Continuing our rummage through the editor’s files, we found several more excellent articles that didn’t quite fit into the themes of recent issues. 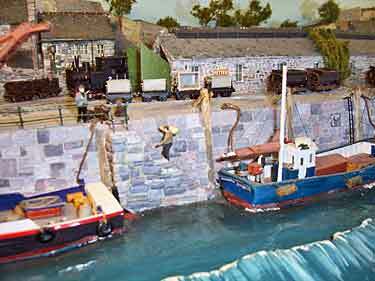 They range from an N scale cog railway to several very tiny O scale standard-gauge lines. And the collection includes our very first Nano Layout, on an atomic-sized baseboard! Here they are… a gaggle of small layouts that can provide big inspiration and enjoyment. The Smallest Micro—”Railroading” on an atomic scale! 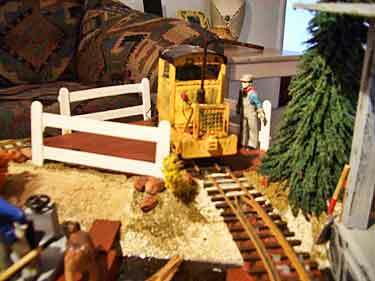 SprocketBahN—N scale working cog railway! Video proof! 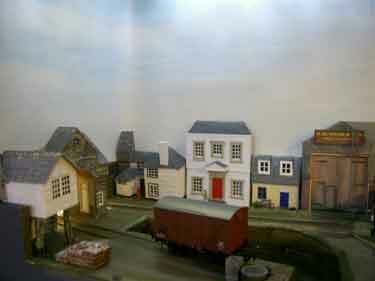 Under Milk Wood is a OO9 (4mm scale on 9mm gauge) layout set in the Welsh seaside town featured in Dylan Thomas’s poetic radio play of the same name. 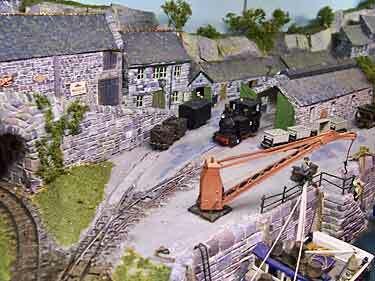 David Rowe built this detailed 4x2ft (120x60cm) layout in the early 1970s using settings from the play with structures based on Barmouth in Mid Wales. 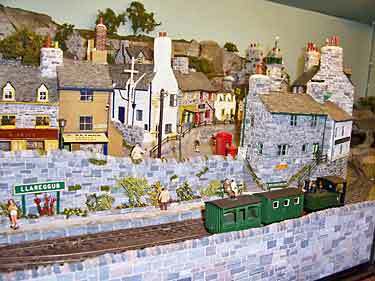 Eventually David sold the layout to the Welsh Development Agency who used it to promote tourism. Then it was put into storage. John Forman (at right in this photo) is now restoring it. 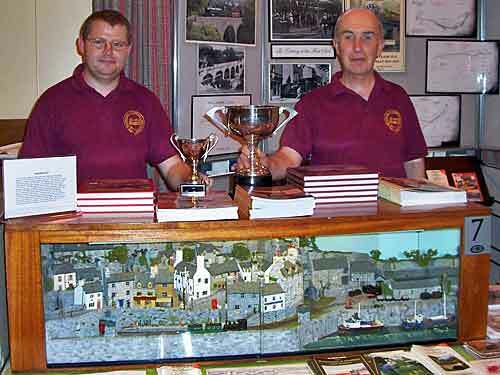 Gareth Houghton (at left) tours the long-lived layout on the exhibition circuit, where it has won several awards (these cups are from Loughborough Model Railway Exhibition in 2006). Gareth also took the photos. 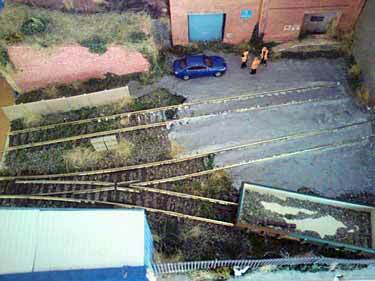 O STANDARD-GAUGE LAYOUT NO LONGER THAN 5ft (152cm)? IMPOSSIBLE? A few months ago Prof Klyzlr, the Sydney Satrap and perpetrator of Brooklyn: 3 AM, posted a challenge on the Small Layout Design discussion group at Yahoo. 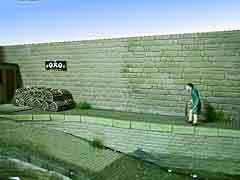 He had been asked if he could build for an upcoming exhibition an O scale mini layout no longer than 5x2ft (1.52×0.6m) and capable of using full-sized U.S. standard-gauge equipment without “gimmicks” like hidden sector plates or cassettes. This is truly a difficult challenge! 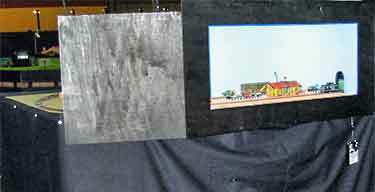 This site contains a number of O scale designs in the requested size range (see Scrapbooks #30a, #32, #35, #65a and #66a)… but most of them use hidden fiddle yard devices to make operations possible. Here are three suggestions so far offered that meet these difficult criteria. These pages are open to all other ideas for accomplishing this tough design challenge! 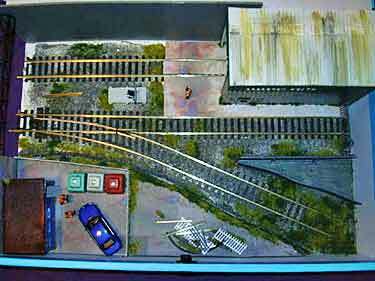 John Garaty, from Unanderra, Australia, focused on an RIP Track yard as a way to represent a lot of activity in a small space. He expanded the idea of Carl Arendt’s Carnegie Car Shops, providing a fully-modeled and prototypical traverser as a way to feed the various repair tracks. Locomotives are repaired along the front track, and the rear (semi-concealed) track is the arrival/fiddle yard area. This little layout provides lots of operation—perhaps drawing cards from a deck could take care of car routing! For more ideas about RIP Track operations, see Scrapbook #30a. Dave Ostwald took a different approach. Referring to another layout on this site, Dave suggested modeling a variation of A Keg of Coors. To fit the length, he could use only two shipping spots; but expanding the loading doors to both sides of the drill track could lift the layout’s operations. Claims Dave, “The Transfer tables would have to be independent (three per spot) and operate in the manner that the prototype did, where either of the loading tables ‘pushes’ the (middle) switching table out of the way to align itself with the other switching tracks. As a result the layout is compact, operational, and prototypical.” Wow! Another way to get lots of action in a tiny space is to use capstan switching, where the locomotive pulls a rope snubbed around a post or capstan to haul the wagons into place. This concept started as a sketch by the pseudonymous Puffernutter, and was later taken up by Shortliner Jack Trollope, from the Highlands of Scotland. Jack suggested, “I’d be tempted to add two more capstans (in red) and model the warehouse with the track going into it, with operating opening doors, and actually pull the wagon inside and close the doors while it is being loaded/unloaded. With the extra capstans you can actually pull the wagons onto the turntable and then pull it into the warehouse. IS THIS THE SMALLEST POSSIBLE MICRO LAYOUT? Tim Cotter, who lives in Stanley, Falkland Islands, forwarded a news story from the American Institute of Physics. It’s a discussion of “nano-locomotives” that could haul materials around the microscopic nano-factories of the future! The story includes a diagram (below) of what may be the smallest possible micro layout… it’s a nm-scale locomotive moving on a circular track measuring only a few molecules on a side! The locomotive is made of three tiny clusters of atoms connected by “springs” that are made of photochromopher molecules, whose length can be expanded or shrunk with light. The “track plan” is made of tiny pits in a surface, looking something like a molecular-sized egg crate (but perfectly smooth to the naked eye). When a laser light is bounced off the surface from above, the locomotive expands, then contracts into the next depression on the surface. Voilà! an atomic pizza layout! Click on the drawing below to be transported into the atom-sized world of Nano Layouts, then click on the video triangle (at lower left) to watch the nano-pizza run! 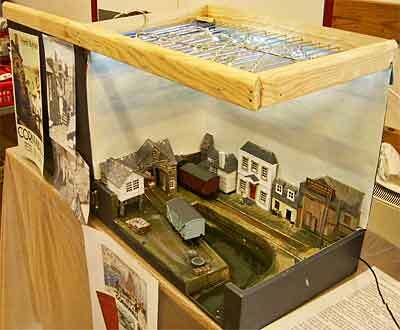 Stu fabricated the layout base from foamcore board and scratchbuilt all the structures, copying buildings from prototype Cornish harbor towns. 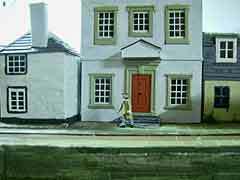 Scale is OO (1:76 on 16.5mm gauge). The complete design/construction saga can be viewed on RMweb. 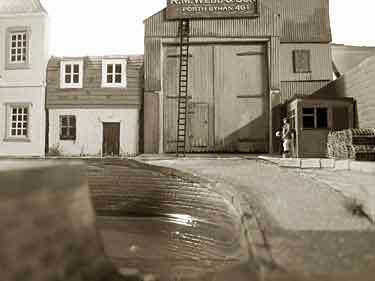 Jon Songøygard, from Arendal, Norway, sent along plans for his latest foray into Gn15 modeling (1:22.5 scale on 16.5mm gauge). After considerable head scratching, he settled on modelling a Chocolate Factory (“Sjokoladefabrikk” in Norwegian), served by a tiny 400mm (15in) gauge railway. The plan is shown at lower left, below Jon’s ideas for scenery on the line. 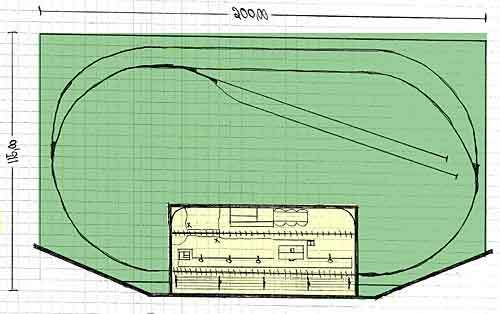 We hope to bring you some progress reports as work begins on this nifty layout idea. The editor thinks this layout is a prime candidate for the “aromarama” approach… the smell of the activities adds another dimension of reality to the experience of viewing the layout. Carl Arendt did something similar in his SAP Line, which displayed a maple-sugar production house with smoke strongly scented like maple sugar. 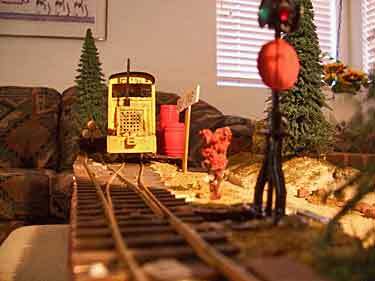 At the age of 12 Jarod Black, from San Diego, California, USA, has built his first model railway, and it’s – as the English would say – a cracker! Measuring 48x16in (120x40mm) the layout is Gn15 scale and features a Schomberg Scale Models “Winky” Brookville switching locomotive. Jarod calls his railroad the October Lake Hydro-Electric Project. It represents part of the vast system on both sides of California’s Sierra Nevada Mountains that captures the winter snowmelt and funnels it through a series of reservoir lakes to the waiting turbo generators that produce southern California’s electricity. October Lake is part of that chain and sports a small Powerhouse generating plant. 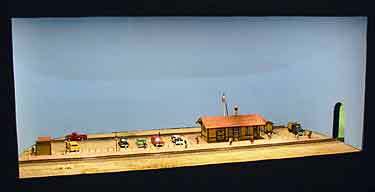 The layout itself includes a sector plate to complete the tight turn around the lake, and features a full-size G scale switch stand from Ozark Miniatures. Jarod produced this charming layout on his own, including purchasing all supplies and the Winky kit from his savings! THE SANTA FE ROLLS ON THROUGH COLORADO… IN LUXEMBOURG! 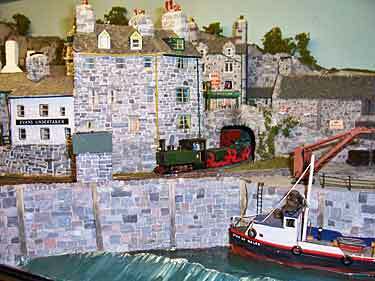 THIS N-SCALE COG RAILWAY HANGS ON THE WALL! After that lecture about shadow boxes, it’s a pleasure to show you a layout that actually is a shadow box! 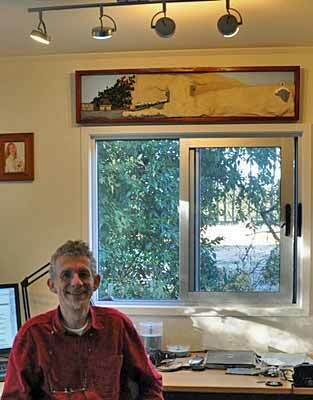 Jonathan Scott, from Hamilton, New Zealand, built this N-scale cog railway, SprocketBahN, to hang on the wall in his home office (right). It measures 48x11in (120x28cm) and is just 2in (5cm) deep (left) ! Jonathan used Fleischmann track, cogs, and rolling stock, with grades of about 25 percent. (He wanted to make them steeper but the equipment and the required vertical curves in the track made this impossible.) The train is powered by eight AA batteries and controlled by a PIC microcontroller to make a trip every 25 minutes or so. For more, see Jonathan’s website. You can watch the valiant little train perform by clicking the triangle in the YouTube video below!